425 Park Avenue held its official topping-out ceremony on December 3, 2018. Its architect Lord Norman Foster, head of Foster + Partners, along with several keynote speakers including David Levinson of L&L Holding Company LLC and Masaoki Kanematsu of Tokyu Land Corporation spoke at the reception, held on the 20th floor of the the building’s first and largest tiered setback. The 41-story, 897-foot tall building is the 17th-tallest building under construction in New York City, and has grown out of the old remains of the original structure that formerly stood on site. The un-demolished section is being repurposed as part of Midtown’s first new full-block office skyscraper in over 50 years. The tower is being developed by L&L Holding Company LLC while Adamson Associates is the architect of record. Construction is moving fast for 425 Park Avenue, as is the curtain wall. The new Midtown office tower rising on Manhattan’s most prestigious thoroughfare saw steel begin climbing rapidly as soon as construction breeched the original partially-demolished extant structure. As it now stands, topping out appears imminent. The concrete core has reached the top floor, while the steel has 15 more stories remaining before its final 41st level. L&L Holding Company is responsible for the development. 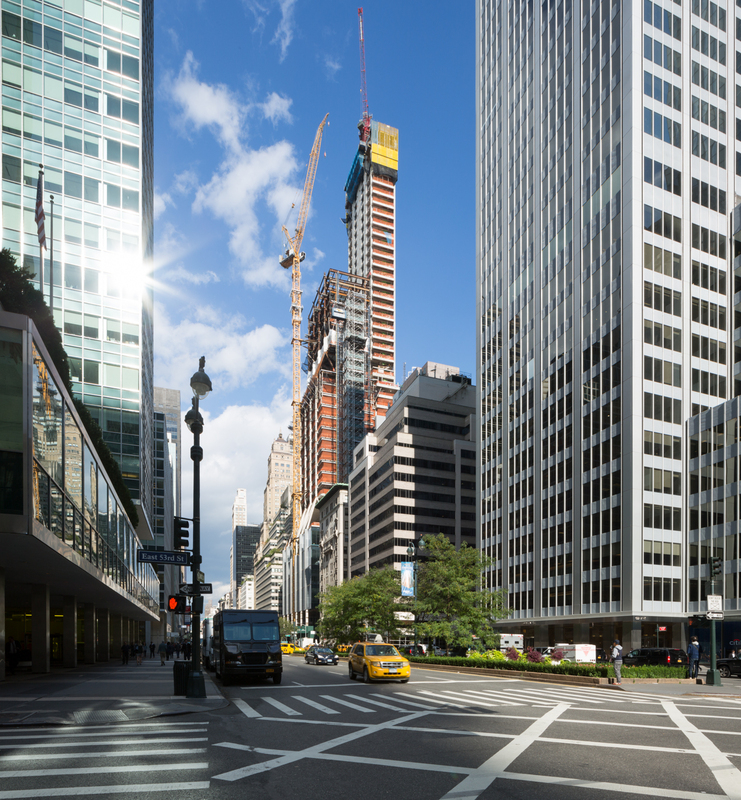 The Foster + Parters design for 425 Park Avenue’s revamp is making major progress. The Midtown office building will be aesthetically divided into three sections, with proportions defined by the remains of the formerly extant structure, which comprise its lowest floors. Thanks to Tectonic, we can confirm that the new tower is now making the transition from its second section into the final, vertical rise. Construction has 22 floors left until topping-out, or just over half of the 41 total floors that will result. 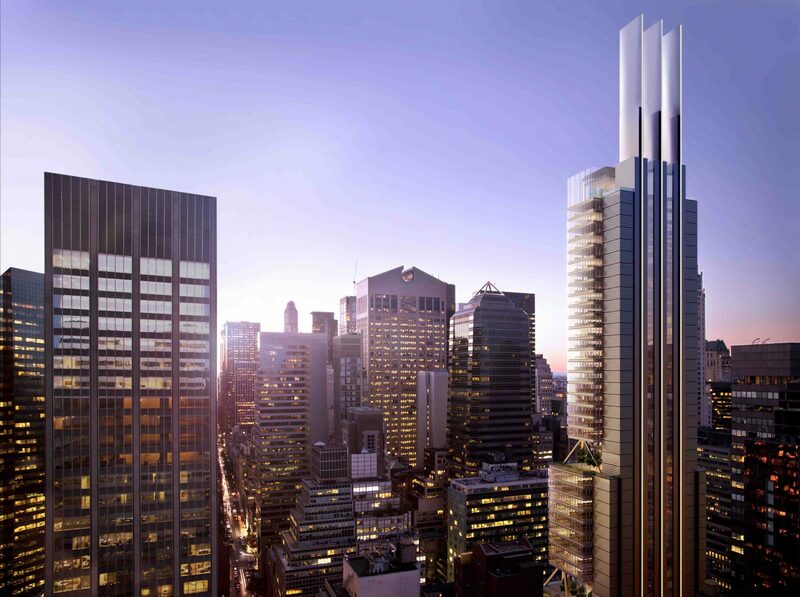 425 Park Avenue in Midtown East has been the focus of much interest, with good reason. Unlike the full demolition and larger replacement impending for the Union Carbide Building, the old pre re-zoning regulations forced 425 Park’s developers to maintain 25% of the extant structure in order to build to its exact original square footage. Now, steel and concrete for the Foster + Partners creation are finally rising above the old shell, and the project is slowly moving upwards and into the neighborhood skyline. The blocks of Hudson Yards are the current hotspot for office construction in New York City, with supertall after supertall rising from nothing. But Midtown East might be the only location in Manhattan where major office projects are rising alongside existing fabric. While One Vanderbilt is only beginning to rise above 42nd Street, work is substantially further along at 425 Park Avenue, where Norman Foster’s vision is now climbing past the stump remaining from the site’s former occupant.